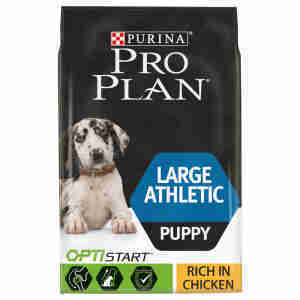 Help your large pup grow up to be a happy and healthy adult with Purina Pro Plan dog large puppy athletic with OPTISTART rich in chicken dry food. This Purina chicken-flavour recipe helps get your puppy started on a healthy and balanced diet right from the moment they're able to eat dry food. It's specially formulated to help their growing bodies and give them tons of energy to support an active lifestyle. Colostrum's a key ingredient in this dry food. It's found in your puppy's mother's milk and, with a helping hand from vitamins E and C, helps boost your pal's natural defences against nasty infections. Remember to have a chat with your vet before you switch up your little buddy's diet. vitamins C & E for a healthy immune system. Made especially for large, active puppies, the yummy Purina chicken flavoured dry food has just the right balance of nutrients for them to get a head start into adulthood. The biscuits are packed with protein (great news for the immune system) and are a tasty source of energy for your puppy to help them stay active and lively as they grow up. The dry food has a high fibre content that's also easy to digest, so you can be sure that your furry friend's digestive system isn't causing them any trouble. The omega-3 and other fatty acids that are part of this recipe help keep your pup's skin healthy and their coat nice and shiny.